Last year, I picked up a Meade DS-16. It was a large, bulky telescope of early 80s vintage. Using it was like wrestling with a dead elephant; it had a clock drive for tracking RA, but no fine controls at all, so aiming it precisely was very difficult. 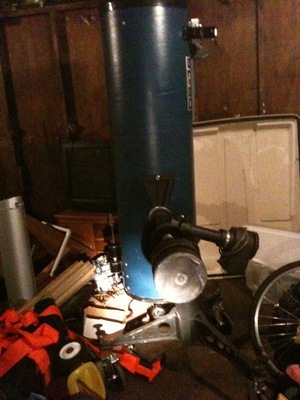 On top of that, the tube didn’t rotate at all, so it was really easy to get the telescope into impossible positions. 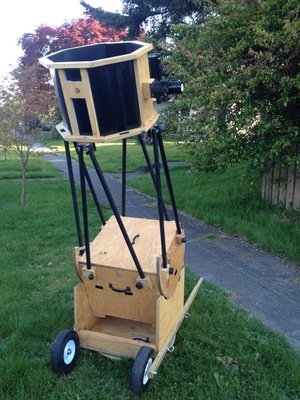 When the telescope was pointing south, it was very difficult to look through the eyepiece. I had to stand on a stool and the mount to be able to get a look through it, because using a ladder didn’t help at all (the ladder got me higher, but it didn’t really get me any closer). This was not an ideal situation, but it was tolerable until the thing fell on me while I was taking it out of the garage. I escaped serious injury, but decided enough was enough. It was time to convert the beast to a Dobsonian that would be easier to use and that I’d be able to take to Mt. Rainier or Mt. St. Helens. Below the fold are more pictures of the Dob at different stages of building, and some discussion of how I built it.